It is as simple as that, no beating around the fact. Over the course of the past hundred years or so, the world has begun to walk down a dangerous road. I would never argue the merits of technology, yet the state of affairs it has left us in is almost sickening. The first world mentality of making everything disposable, cheap and fast to produce has shifted our perspective far from the path of the Age when mankind took value in the nature of possession. Tools were meant to serve their purpose and to last beyond a single task. Homes were meant to be cherished as a place of sanctuary and comfort instead of a temporary step until the future brought about a better prospect. Food was made by the caring hands of people who could look out a window and say exactly where it came from. But so little of that remains now that, unless those few hold onto those ways, it will be lost forever. The walls in front of me are cheap slabs of drywall covered in cheap plaster, painted with cheap paint and adorned with fibreboard framed prints and plastic decorations that no craftsman would ever be proud to say they created. The roof above me is shingled in synthetic cloth covered in crushed gravel and tar bought by the hundredweight. The food I ate came in a thin plastic shell adorned with bright colours and the small square filled with nutrition facts that would kill mice by the score. 1660mg of sodium in a mere 3 ounces. Acetylated Monoglycerides. Apocarotenal. Lactic Acid. Monosodium Glutamate. Ferrous Sulfate. The tag sewn crooked into my shorts reads 82% polyester. What is the other 18%? Maid in China. Not made? Hecho en México. Thailand. Korea. Assembled in Vietnam. I am grateful for the roof above my head, the food upon my plate, the clothing on my back, the opportunities afforded to me over the years I have already lived and the time that remains to be held. I am grateful, but I cannot look in a mirror without finding a bitter taste of disgust. "This summer I saw King Tut's tomb." "No, I saw a replica in the Egypt section of Busch Gardens." Gaudy colours and plaster covered chicken wire. Shops playing popular music out of the speakers above their doors, enticing tourists to their wares. There on the wall in the waiting queue hangs a collection of faux tribal sticks and torches bound together with cloth. No, that is just mesh where the paint has chipped away. There above the entrance are a collection of metal lanterns with heavy bolts holding them against the afternoon storms. No, they are plastic, the injection-moulded seams so obvious that whoever pulled them off the assembly line checked to see if they were in one piece and left it at that. This is supposed to be entertainment, and it is just a lie. Fake. Shallow and depressing. The world is melding together, the only culture people know rising from the silver screens and amusement parks. So many people will live content with deception. So many people will never appreciate the living bridges of Cherrapunji, woven for generations beyond the eyes of western civilization. So many people will never experience the massive subterranean world of Son Doong, or South Africa's Victoria Falls, or the Stave Churches of Norway. We are living in a dream that, when we wake, the only comfort that remains will be our memory. Sadly, it seems that if it is not presented on a backlit display, no one longer seems to care. "No, that is the past thirty years of human history." They say that the largest elevation change on Long Island is its landfill. Seeing the traditional Finnish carpenters build a house with an axe and an adze from nothing but trees and rocks, it makes me wonder how long the asbestos insulated 'American Dream' will last. We have churches that celebrate their millennia anniversary, but what will be left of our Age a thousand years from now? Ruins of the glory days. Rusted metal and broken glass and trash heaps that climb the mountainsides. Why? Because that is what our mentality has become. Use and forget. It does not need to last a lifetime, only long enough to do the job. Why? Because there will be something better if I ever need it again. Why invest when the technology will be outdated? But hammers have not been reinvented in the last year. Nor have the shirts I wear. Or the shoes on my feet or the frame of my bicycle. I saw an armguard the other day, the sort used for archers to protect their wrists. Black plastic with elastic cords to hold it on. Did it serve its purpose? For the time being, it would. $5 is a small price to pay. It is forgettable, liquid. And so is the object it procures. Why buy what you can make? And so I decided to make my own. Brass and leather, no painted plastics or synthetic fibres pressed into a sheet. I decided to make my own because I know it will last. I know that I value my own workmanship, and that if I am willing to put the time into producing it that I too am willing to see it done properly. If I take the time to create this object, I know I will not be throwing it away or replacing it when they invent new bulletproof armguards that you cannot cut and can be hit with a train, because I do not need that. Nor, it could be argued, do I need an armguard at all, same as I do not need a bow or the arrows to shoot out of it. I do not need the tools I use or computer upon which I write. I do not need a car, I do not need shoes. But it is not my aim to reduce human life to its simplest form. I do not wish to take it all away; rather, I seek to take these hands that have been so graciously given to me to create things that replace the artificial nature that humanity has tended towards. Why is it that we can still find thousand year old artefacts, yet a thousand years from now all they will find is a heap of refuse? Because we chose to make it that way. A lantern, a knife, a bow, a map- if I can make it, I will. If I can make it, if I can understand the process and gain the skill, I will hold no illusions as to its composition. I know that this ink will not be washed away with yesterday's rain, I know that this wood is not particle board. I know that I can trust this steel to cut without breaking and to hold an edge beyond what the commercial knife would claim. I know that this bread will not work against my body. In a turn of the century farmer's barn where scythes and pitchforks were not hung on the wall to decorations, in an old time blacksmith's shop where the timbers are painted black with the dust of coal, in the basement of a house with a stone foundation, in the middle of a field where the only thing around is nature itself, the simplest things make all the difference. 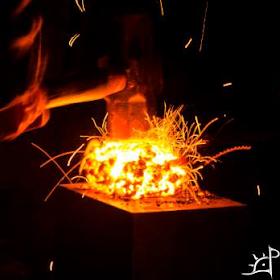 Forging with a hand made hammer upon steel smelted from nothing but ore, carving with a hand made knife, shooting with a hand made bow, lighting the room with a hand made lantern, there is something about the nature of hand crafted objects that can never be replicated. What you surround yourself with is what others use to identify you, to measure you. In a sense, they are what you become. I want to be inspired by the tools I use, to feel the sweat of labour that went into creating them. 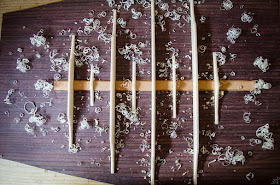 I want to be driven by the passion of that craftsman as I use their legacy to create my own work. I want the walls around me to spark my imagination and thoughts of places of the distant worlds once so well versed in the arts I try to reproduce. I want not to sit in a room and feel like it is instead a prison. I want to love working where I work and want to come back to that place every day for the rest of my life. I want to be inspired by my dinner plate and the table beneath it. By the fire that cooks my meal and the hearth that contains it. The pots and the pans and my door catch and the hinges. It may seem foolish, it may seem naïve, but it does not need to be that way. It does not, and yet for so many it is. Only premium quality. Genuine. Precision. The finest. Luxury. What do these words mean to you? Great post John! I can totally identify with what you're feeling. It's important to use these feelings to make things better (which you're doing), and not become depressed by them. How terrible this mentality becomes when translated into people and our social interactions. I fear for my children. Keep holding the line my brother!